New Delhi: In a bid to lift consumer demand and counter slowing economic growth, the Union government on Sunday announced a Rs31,900 crore stimulus package that included a 4% reduction in excise duties, selective interest subsidies on borrowing by exporters and a boost to infrastructure investments. about:blanka886c0da-c478-11dd-94b6-000b5dabf636.flvThe package is meant to reinforce monetary policy measures unveiled on Saturday by the Reserve Bank of India (RBI), which cut key interest rates by 1 percentage point, Montek Singh Ahluwalia, deputy chairman of the Planning Commission, told a press conference. The package aims to counter a downtrend in the economic cycle through additional government expenditure and boost consumption through the excise duty cut that would cover most products, including consumer durables such as cars as well as intermediate products such as cement. If producers pass on the duty cuts to buyers, it would also lower sticker prices. The industry lobby, the Federation of Indian Chambers of Commerce and Industry, or Ficci, expressed cautious optimism about the package. “The fiscal package is pointing in the right direction, but could have done even more of stimulation to increase the growth trajectory," Amit Mitra, secretary general, Ficci, said. “The economic stimulus provided by the government should not be looked at in pieces. Combined with the supplementary demands for grants and the rate cuts announced by RBI on Saturday, it is a substantial stimulus package," said M. Govinda Rao, director, National Institute of Public Finance and Policy. “Given a much bigger fiscal deficit, the government had little fiscal space for additional spending. Now, the government should enable private sector to spend more." The package would ensure the economy grows at 7% this fiscal, Ahluwalia said. RBI in its mid-term policy review forecast economic growth to be between 7.5% and 8% for the fiscal. In addition to the measures announced by RBI and the government over the weekend, Ahluwalia said public sector banks would soon announce measures to support individuals who take home loans of up to Rs20 lakh. According to finance secretary Arun Ramanathan, the average size of a home loan in 2007-08 was Rs7.5 lakh. One realtor predicted affordable housing projects would increase as a result. “These measures will stimulate demand," said R. Nagaraju, general manager, corporate strategy and planning, Unitech Ltd. “A large proportion of loans is in the lower end (below Rs20 lakh), so it is understandable that the government’s focus is in that end. Developers will now have to provide affordable houses in that range." But, according to two senior public sector bankers who spoke to Mint on condition of anonymity, the government has not communicated anything on home loans to banks. “We have not got any communication from the government regarding this. I don’t know what kind of package will be adequate to boost the housing sector," said one of the bankers. “This is not the right remedy to boost home loan growth," said the second banker. “Some PSU (public sector undertaking) banks have already lowered the home loan rates by 50-75 basis points to 9.5%. Our home loans are cheaper than deposits now. What else we can do?" he added. Representatives of the automobile sector were pleased by the proposed 4 percentage point cut in the Central value added tax, or Cenvat, clubbed under excise duties. Dilip Chenoy, director general, Society of Indian Automobile Manufacturers, expects the benefits to kick in by January. “As soon as industrial activity rebounds, it will stimulate demand for the commercial vehicle segment," Chenoy said. “When interest rate reductions happen, this will stimulate demand for cars." A spokesman for Maruti Suzuki Ltd, India’s biggest car maker, said he expected the cut in levies to translate into about Rs8,000 on the company’s Alto model, which starts at Rs2.33 lakh. The benefit “will be passed on to customers" with immediate effect. Executives at Tata Motors Ltd, Mahindra and Mahindra Ltd and General Motors India Ltd, too, said customers would get the benefits. In addition to boosting consumption, Ahluwalia emphasized the significance of direct government spending to support infrastructure investments. An additional Rs20,000 crore in Plan expenditure would go towards such projects, which would require Parliament’s clearance. The additional spending is a part of the government’s aim to spend around Rs3 trillion in the residual four months of the current fiscal under both Plan and non-Plan expenditure. This would include regular expenses such as salaries and investments in infrastructure. The budgeted spending for the entire year was Rs7.5 trillion, which did not include items such as payout on account of the salary increase recommended by the Sixth Pay Commission. 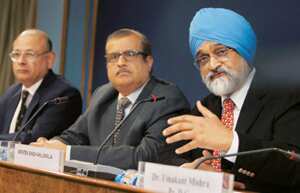 India’s fiscal deficit will be larger than budgeted (2.5% of gross domestic product), Ahluwalia said; he did not put a figure to it. According to the office of the Controller General of Accounts, which maintains the accounts of the government, during the first six months of the current fiscal, the government has spent 49.2%, or Rs1.19 trillion of the budgeted Plan expenditure. With the additional Rs20,000 crore stimulus through various schemes, the government has to spend Rs1.43 trillion during the second half of the fiscal, two months of which have gone by. In a statement, the government said total spending in the balance four months of the current fiscal (December-March), taking Plan and non-Plan expenditure together, is expected to be Rs3 trillion. But this would be subject to the capacity of the economy to absorb it. During the first half of the current fiscal, the government has spent 54.4% of the total expenditure as compared with 54.2% a year ago. In road projects, Ahluwalia said the government would aim to bring about financial closure in investments of Rs1 trillion over the next 18 months. These would be implemented over the next three years, he added. The government’s track record, so far, has indicated the pace of implementation is slower. According to an official with the National Highways Authority of India, or NHAI, the highways regulator has been unable to award projects on account of procedural wrangling between the Planning Commission and the ministry of shipping and road transport. “The highways projects are stuck. They have not been able to award a bulk of these projects and it is unlikely they will do so before the elections," said this official who did not want to be identified. The Manmohan Singh-led Union government’s term expires in May next year. Highway construction projects that add up to about 15,000km of highways under the third and fifth phase of the so-called National Highways Development Programme are yet to be awarded. The awarding process has been delayed after contractors went to court over a bid regulation they said would lead to cartelization. The government subsequently withdrew these regulations. Many contractors are also shying away due to high interest rates and viability concerns. Sunday’s stimulus package would have done its work if it instils confidence among contractors to bid, one expert said. “The need of the hour is to ensure that those contracts that have already been awarded achieve financial closure and start construction," said Harsh Shrivastava, senior vice-president of infrastructure consultancy Feedback Ventures Pvt. Ltd. The stimulus package plans to use government-owned infrastructure financier, India Infrastructure Finance Co. Ltd, or IIFCL, to enhance liquidity in the sector. IIFCL will be allowed to borrow Rs10,000 crore through tax-free bonds in the next four months of the fiscal and proceeds used to refinance banks that lend to infrastructure developers. Mint’s Samar Srivastava and Shabana Hussain in New Delhi and Anup Roy in Mumbai, and Reuters and PTI contributed to this story.